Cover big styrofoam mushroom with red (approx. 250 g) and white (approx. 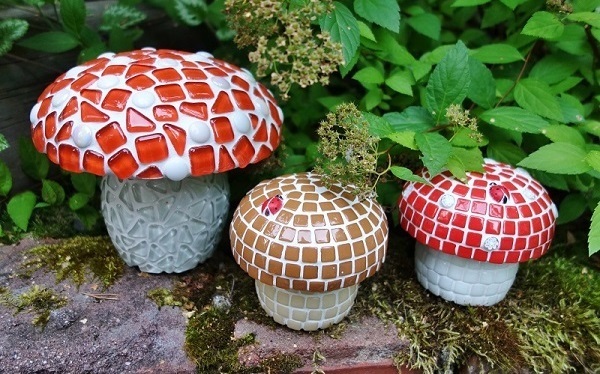 250 g) softglass mosaic, and add mini gems (50 g) on mushrooms cap. Cover little styrofoam mushrooms with brown (cap approx. 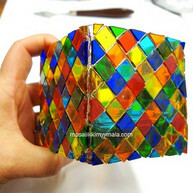 100 g) and light brown (leg and under cap about 100 g) ottoman glass mosaic. Glue pieces with Olba- or Silicone glue, grout the mushrooms with white or grey grout. 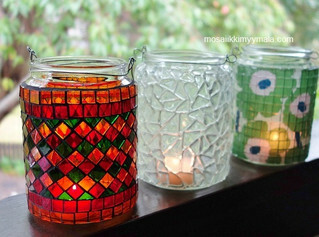 Choose a bright, frost-proof glue for the lanterns to succeed, like Silicone- or Olba glue. Spread the glue a small area directly to the lantern and press the pieces into the glue. 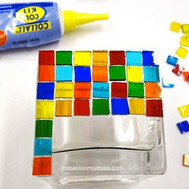 Avoid getting the glue on your fingers or to the top of the pieces. 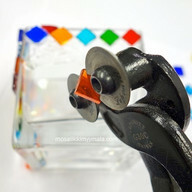 If you want, you can easily cut glass and smalti with wheeled nippers, remember to use safety glasses. Let the mosaic dry well. Put the protective gloves in your hands and mix water and powder well according to the instructions and start grouting. 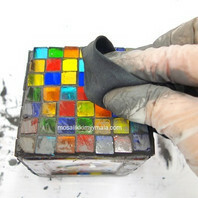 Spread the grout carefully on the mosaic with grout rubber. Keep doing this until all areas have been covered in grout. Let dry some minutes and clean the mosaic first with sponge. For smaller projects you can sometimes omit this step. 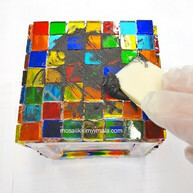 Next, clean the mosaic carefully with a dry rag. Let the mosaic dry well for a few hours. 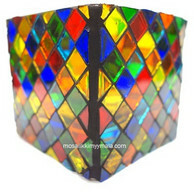 You mosaic lantern is ready! 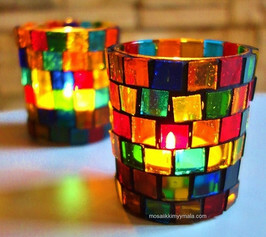 Cover styrofoam pumpkins with different orange glass mosaics and grout them. If you make the holes for the eyes and mouth, you can put the LED light inside the pumpkin.